Oxford and Derby shoes have been extremely popular among women since the early 20th century. Originally designed exclusively for men, these models have become indispensable components of women’s footwear fashion. Timelessly elegant, they make a particularly wonderful supplement to office apparel. Whether wholly undecorated or stylishly perforated, the elegant women’s shoes in our collection are transformed by the Goodyear welting production method into dreamy, covetable footwear of extraordinary quality. Originally designed as men’s shoes, Derby and Oxford shoes have held places in the canon of elegant women’s footwear since the late 1910s. Oxford University students already favoured Oxford shoes in 1830. In the decades to come this model attained worldwide popularity, advancing to the pinnacle of elegance. Then as now, this beloved classic shoe is defined by clean lines and a closed shaft cut. Its distinctive closed lacing, though, has proven troublesome for certain would-be wearers. One such man was a certain 19th-century English Earl. Because of his elevated insteps, this Earl of Derby struggled day in, day out with traditional closed lacing. In order to alleviate his lordship’s feet, his resident shoemaker developed low-rise shoes with additional side pieces. This so-called open lacing not only made it much easier to put the shoes on and take the shoes off, but also allowed the Earl to widen the lacing as desired. Over the years the Derby shoe was also made available to women, who fell in love with this comfortable yet elegant women’s shoe. Some models are fitted with a traditional flat heel, while others feature a graceful elevated one. Our elegant women’s shoes encompass a broad variety of patterns, colour combinations, and cuts. Whether undecorated (plain) or featuring a delicate toe cap seam (cap toe), or rich perforation around the edges of the shaft pieces (brogue), our feminine classic shoes are distinguished by their sophisticated look and feel. Take inspiration from our two-toned Oxford shoes with 1930s flair, or admire the minimalist grace of our plain black Oxford shoes. 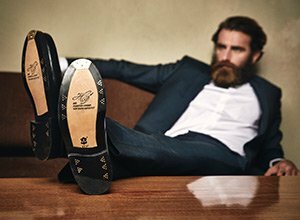 While the flat models are an excellent choice of footwear for the workplace and leisure time alike, our high-heeled Oxford shoes, Derby shoes and loafers ensure a stylish appearance at festive occasions. Our elegant women’s shoes are handcrafted and Goodyear-welted—a true rarity for women’s shoes, even those belonging to the premium tier. This centuries-old traditional handicraft results in full-leather shoes that are extremely durable, stable in form, and long-lasting, and which are quite easy to repair if and when necessary. Moreover, our exclusive collection of elegant women’s shoes also boasts Rendenbach soles. Thanks to traditional oak-pit tanning, these soles are environmentally friendly products of the utmost quality.